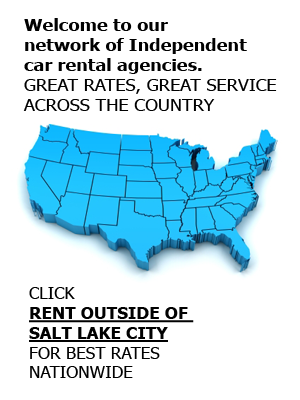 Located less than two miles from the Salt Lake City International Airport, our airport car rental branch offers flyers a convenient pickup and drop-off location for their rental cars. Affordable Rent-A-Car And Sales helps customers ditch the taxi – and the taxi fare. Reserve your vehicle online, or contact us directly at (801) 288-2277 to speak with one of our rental car agents about your needs. We’ll pick you up and get you on your way while others are still waiting in line! A large selection: At both of our two locations, we have a variety of car rental, van rental, truck rental and SUV rental options. Low prices: We consistently have low and competitive pricing on every one of our rental vehicles. Don’t pay more than you should for a temporary convenience. Complimentary pickup and drop-off services: Whether you’re flying into SLC or taking a trip out of the state, we’ll be there to bring you to our office and get you started down the road with a Utah car rental. Excellent customer service: We put the customer first and embrace the entire process of assisting renters with their needs. Door-to-door shuttle: If you live or are located anywhere within the Salt Lake City area, we offer a courtesy door-to-door shuttle service. We’ll pick you up at the airport and bring you to our office, or vice versa. Ask About Our Airport Delivery Service! As always, Affordable Rent-A-Car is here to make travel convenient when arriving at the Salt Lake City airport. Whether you need cheap airport car rentals, or you need to buy a used car or another type of vehicle, our agents can point you in the right direction. We serve the entire SLC area, including Yellowstone, Jackson Hole, Moab, and Park City. Click here to contact us, or call us at (801) 288-2277 for a free quote.